Along with our native Gmail integration, we've also added an Action to our Zapier integration to create messages in Vitally. 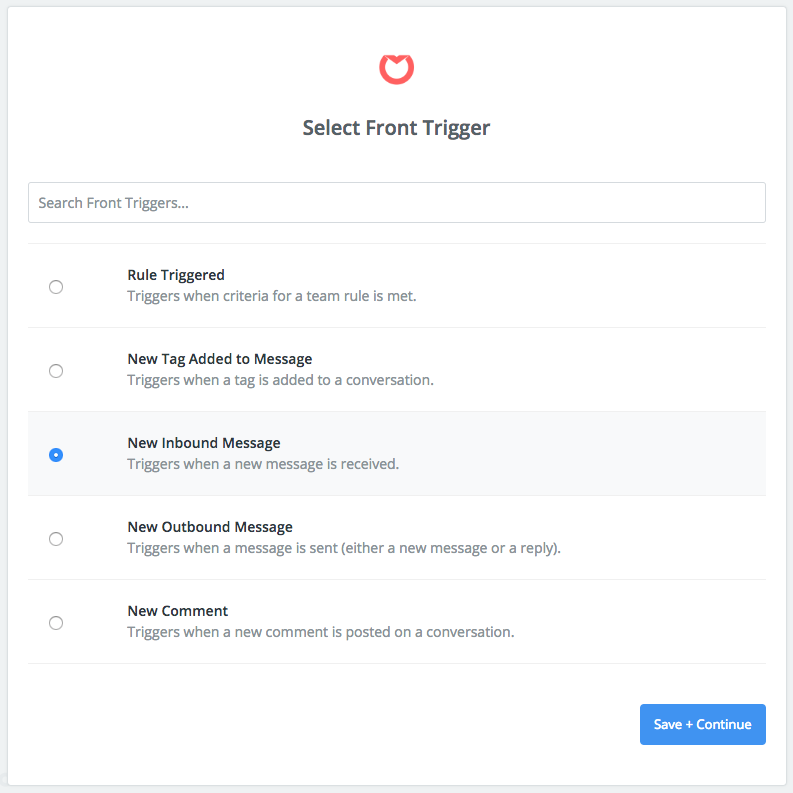 This way, if your support tool(s) have Zapier integrations with triggers that fire when you send or receive new customer messages, you can leverage Zapier to track those conversations in Vitally. Let's see how that works! First, if you've yet to do so, you'll need to enable the Zapier integration in your Account Settings in Vitally. 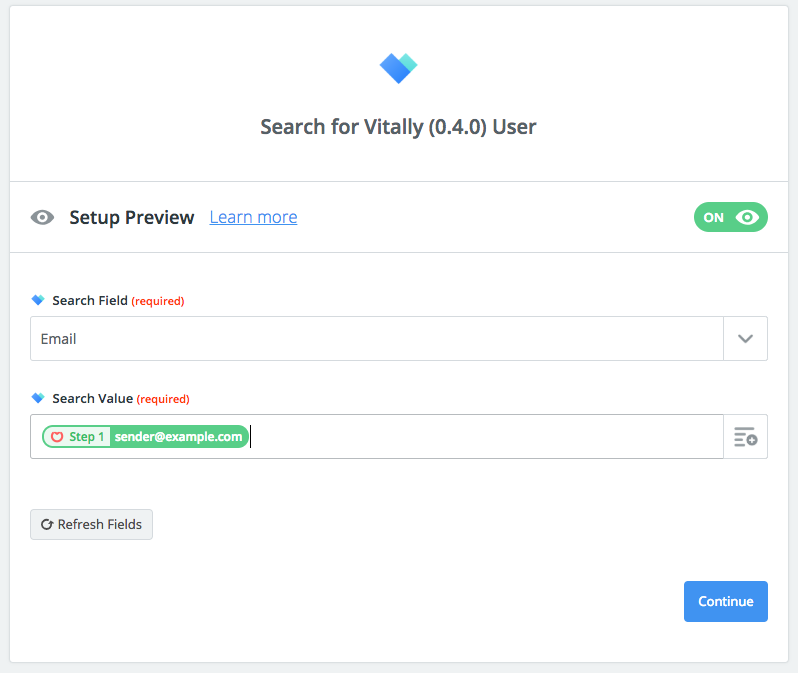 This needs to be done from your Vitally account, as our Zapier integration is currently in beta (which means searching for Vitally from Zapier itself yields no results unless you've accepted our invite to the beta integration). Once you've enabled the Zapier integration, you should see Vitally as an app you can use in your Zapier account. Since the end goal here is to create conversations in Vitally from your support tool, you'll need to setup a new Zap and select your support tool as the Trigger app, using a trigger for new sent and/or received messages. For example, if you are using Front, you can setup 2 Zaps, one for New Inbound Messages and another for New Outbound Messages. Once you've selected a trigger for new inbound/outbound messages, you'll need to create a Search step in your Zap to locate the user at the customer in Vitally that sent and/or received the message (using the Find a User search option). You'll likely do this by searching for the user by email. 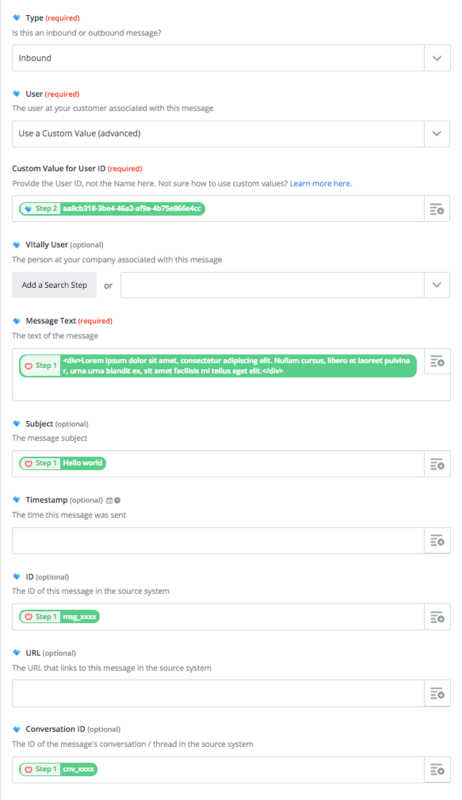 By now, Zapier should have access to 1) the message sent to/from your customer and 2) the user at the customer in Vitally that sent/received the message. All that's left to do is to create the message in Vitally associated to that user! To do this, create a final Action step in your Zap using the Create Message action for your Vitally account. Using the User from your Search step and the Message/Conversation from your Trigger step, create the Message in Vitally. Be sure to select the right Type (inbound vs outbound) based on whether the user sent you a message or you sent them one! All that's left to do now is to turn your Zap on, test it out, and view/report on your customer conversations in Vitally!